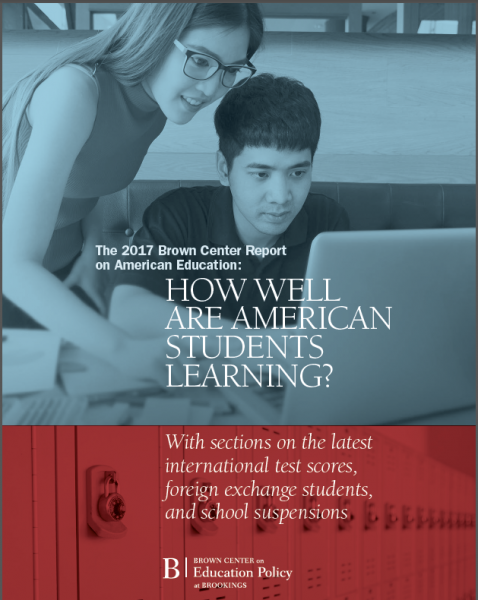 This Brown Center Report (BCR) on American Education is the sixth and final edition in the third volume and the 16th issue overall. The series began in 2000. As in the past, the report comprises three studies. Also in keeping with tradition, the first section features recent results from state, national, or international assessments; the second section investigates a thematic topic in education, either by collecting new data or by analyzing existing empirical evidence in a novel way; and the third section looks at one or more education policies. In Part I, this year’s focus is on the latest results from two international tests, the Program for International Student Assessment (PISA) and the Trends in International Mathematics and Science Study (TIMSS). Both tests were administered in 2015, and the U.S. participated in both. TIMSS tests fourth and eighth grade students in math and science. PISA tests 15-year-olds in reading literacy, mathematics literacy, and science literacy. TIMSS began in 1995. From 1995-2015, the U.S. made statistically significant gains on TIMSS fourth grade math, eighth grade math, and eighth grade science assessments. The four-point scale score gain in fourth grade science is not statistically significant. PISA began in 2000. Since PISA’s inception, U.S. scores have been flat on all three subjects; however, the 2015 math score of 470 marks a significant decline from 481 in 2012 and 487 in 2009. Part II revisits one of the most popular studies in BCR history, a 2001 survey of foreign exchange students. The same survey was conducted in 2016. The idea is simple, asking kids from abroad who have attended U.S. high schools what they think about U.S. education and their American peers. Comparing the results, 15 years apart, suggests that not much has changed. International students still think U.S. schools are much less challenging than schools in their home countries and that American teens are more focused on success at sports compared to their peers back home. Part III examines race and school discipline. Exclusionary punishments, those that remove students from schools, have come under fire in recent years. California officials have been pushing schools to reduce out-of-school suspensions, especially because of the racial disparities associated with that form of discipline. The policy has succeeded in reducing suspensions in the state—they are down dramatically—but racial disparities persist. Black students continue to be suspended at three to four times their proportion of student enrollment. The study examines three years (2013-2015) of California school-level data (a sample of 7,180 schools) to identify characteristics of schools that are correlated with high- and low-suspension-rates for African-American kids. Schools with large populations, schools exclusively serving middle school grades (e.g., grades six to eight), and schools serving a high proportion of poor or black students are all associated with elevated suspension rates for African-Americans. Disciplinary reformers have promoted restorative programs as alternatives to exclusionary punishment, but the approaches are controversial and the empirical evidence of their impact is limited. The current study cannot draw causal conclusions, but altering the structural characteristics of schools associated with higher suspension rates should be considered in future reform efforts.